The international community and Iran meet again in Geneva this week for a fateful round of talks. The discussions are meant to ensure that Iran ceases activities designed to produce the first Shi'ite nuclear bomb – the first of many bombs, if Iran's program isn't stopped. The negotiations aim for a modest initial agreement in hopes of turning that into a final arrangement. But they already sparked a fierce public rift between the government of Israel and the Obama administration, the likes of which have not been seen in U.S.-Israeli relations in many years. Fueling the disagreement are deep concerns in Jerusalem – and other capitals in the Middle East, as well as in Paris – that the Obama administration is willing to settle for a shortsighted, poor interim deal that will cause existing, crippling sanctions to crumble. That would enable Iran to stay on the brink of nuclear weapons production, and enable President Obama to defer the crisis to the next administration. During talks earlier this month in Geneva, Israeli officials were stunned to learn of the deal to which the Obama administration apparently agreed, a deal that was not signed due to France's rejection of the terms. It called for a cessation of 20 percent enriched uranium production, but allowed for the continued production of 3.5 percent uranium, and most disturbingly to Israel, left every one of Iran's centrifuges in place. By leaving the centrifuges in place, this arrangement ensures that Iran can quickly create the amount of uranium needed for a bomb at any time. And by leaving the current stockpile of low-enriched uranium in place, such a deal means that Iran can convert this material to military-grade material at will, through a process that is relatively quick and technically easy. The draft agreement also failed to address the heavy water reactor in Arak. In exchange, suggested rewards to Iran included the unfreezing of $3 billion of frozen fuel funds, an easing of sanctions on the petrochemical and gold sectors, an easing of sanctions on replacement parts for planes, and a loosening of restrictions on the Iranian car industry. The U.S.-led attempt to reach an interim deal with Iran is not necessarily a bad thing in itself if it actually stops Iranian nuclear activities for the duration of further talks. But the arrangement floated in Geneva would not have stopped Iran's enrichment activities. Instead, it would have lifted four different sets of sanctions and served as a green light for European and Chinese companies, hungry for business with Iran, to flood the Iranian market. That would lead to a collapse of the remaining sanctions. In Israel's eyes, this interim deal would have been a mistake of historic proportions, causing irreversible damage to prospects for an acceptable final deal. It would have been a victory for Iran's skilled negotiators, and saved the Islamic Republic from having to seriously consider making concessions. It is sanctions that drove Iran to the brink of economic collapse and forced the regime to the negotiations table. If this vital pressure lever collapses now – before Iran has taken a single meaningful step back from the nuclear brink – a military strike will remain as the only measure standing between Tehran and the bomb. According to Israeli assessments, Iran would be able to build an atomic bomb less than six months after Supreme Leader Ayatollah Khamenei gives the order. It has built 19,000 uranium enrichment centrifuges at two nuclear sites, Natanz and Kom. Of these, 12,000 are active first-generation centrifuges, and the remainder are newer, faster machines, waiting to be switched on. Under the cover of a civilian energy program, Iran has been producing uranium and enriching it to low and medium levels. This is a bit like loading a gun but choosing not to pull the trigger yet. If enriched further, the uranium would be sufficient in quantity for the production of nuclear weapons. Specifically, Iran already amassed enough low enriched uranium (3.5 percent) to make six bombs, and nearly enough medium enriched uranium (20 percent) for one bomb, if this material is enriched further to military-grade uranium (over 90 percent). Meanwhile, a parallel plutonium track is being developed, via the heavy water reactor in Arak. Senior Israeli political sources have expressed amazement that U.S. negotiators, under the White House's directives, telegraphed a greater enthusiasm to reach an agreement than the Iranians, and offered terms that jeopardized the sanctions regime. This development came although Iran is on its knees economically, and initiated the talks to save the regime. The dispute does not look like it will vanish soon. Israel will continue to lobby heavily for a more reasonable agreement, while preparing for the eventuality that its efforts will fail, and that it may have to militarily confront Iran by itself. If Iran get its way in the coming round of diplomacy, a crack will appear in the chokehold of sanctions on its fractured economy. Iran will be able to keep the majority of its nuclear program in exchange for minimal concessions. Currently, the sanctions, such as those placed on Iran's central bank, have caused very high inflation, and the price of basic goods in Iran has skyrocketed. The sanctions also severely devalued the national currency. Should the sanctions crumble, Iran will be freed from having to choose between economic survival and its nuclear program, and can quickly advance to the weapons phase, at a time of its choosing. Faced with two options, either watching a bad deal take form – one that increases the chances of military action – or publicly breaking with President Barack Obama and Secretary of State John Kerry in order to apply pressure to the international community, Prime Minister Benjamin Netanyahu chose the latter. Israeli pressure to save the sanctions, together with concerns by other regional states alarmed by the U.S.'s soft stance on Iran, have had some effect. France, the only Western party to the P5+1 talks that agrees with these concerns, refused to ratify the deal in Geneva. Currently, talks can lead to one of three outcomes: A compromise, middle-of-the-road final deal, a poor deal, or a failure to reach any agreement at all. The possibility of a "good" deal, in which Iran gets rid of all of its nuclear assets, is unrealistic. Iran has spent too much money, effort, and resources on its nuclear program to scrap the entire project now. But a reasonable compromise would force Iran to move back by two to three years from its present nuclear breakout capacity. Under this type of agreement, oil and banking sanctions would only be lifted after Iran takes verifiable steps to disband core elements of the program. And any reasonable interim deal would leave nearly all sanctions in place until a final deal is reached. 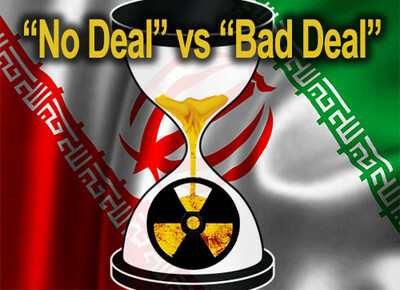 A bad deal will leave Iran with most of its nuclear program intact and cause the sanctions regime to crumble. Alternatively, the sides may fail to agree altogether. Iran is already a major threat to regional and global security. Its nuclear program multiplies the dangers. As the world's top state-sponsor of terrorism, Iran destabilizes the Middle East with a transnational network of heavily armed, terrorist-guerilla proxies. It facilitates the massacre of tens of thousands of civilians in Syria, subverts pro-Western Arab states, and remains ideologically committed to Israel's destruction. It operates under the banner of jihad and the spreading of its fundamentalist vision of Shi'ite Islam. If Iran gets the bomb, it could adopt even more dangerous policies and pursue them with impunity under a nuclear umbrella. Future steps, like arming proxies with a dirty bomb, or pointing intercontinental ballistic missiles with nuclear warheads at Western cities, would pose the biggest threat to global security in decades. This nightmarish scenario would undoubtedly spark a Middle Eastern nuclear arms race, in which unstable Arab regimes will acquire atomic bombs to counter Iran, before possibly being taken over by radical Islamists. The world's most unstable region would then be filled with the world's most dangerous weapons – a recipe for disaster, and for nuclear terrorism. This is why Israel's government has decided that, if forced to choose between accepting an Iranian bomb or bombing Iran, the latter option is preferable. This calculation holds true if the P5+1 states ends up striking a poor deal. It is reasonable to assume that a bad arrangement, which visibly fails to put the brakes on Iranian steps towards nuclear weapons, will leave sufficient international legitimacy for an attack. But even if Israel does face international isolation and wrath after a strike, this outcome would be preferable to dealing with an existential danger to its security, and navigating a region that would become intolerably dangerous. Hope in Jerusalem remains that negotiators in Geneva will not be manipulated by Iran into signing an agreement that will force Israel into the unenviable situation of having to act alone. Let Israel invade Iran, not the US. The US has no reason to attack a country which has done nothing to deserve invasion. The US must stop being Israel's enforcer and maintain the neutrality that our founders intended. Thank you for pointing out that Iran "operates under the banner of jihad and the spreading of its fundamentalist vision of Shi'ite Islam." However, your words make it look like there is something peculiar about their "fundamentalist vision of Shi'ite Islam." There is nothing peculiar about it, and it is not especially Shi'ite or especially fundamentalist. It is standard Islam.